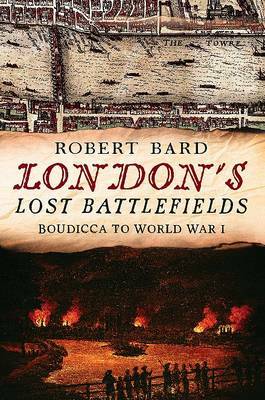 London's Lost Battlefields hides the ghosts of bloodshed and rebellion from Boudicca to the devastating but little known Zeppelin attacks of the First World War. The Peasant's Revolt of 1381 saw murder and plunder in central London, notably at The Savoy, where the present day hotel is located laid claim to thirty-two rebels who whilst drinking wine in the cellar were trapped by fire and falling masonry and over several days died there. St Albans was the site of two vicious battles during the Wars of the Roses where an eyewitness said that the market place ran with blood. One of the bloodiest battles of the Wars of the Roses took place just north of Barnet. Under a nearby field lie the bodies of between 3,000 and 4,000 forgotten soldiers of the Wars of the Roses. This book suggests the location. The Wyatt Rebellion in 1544 saw London streets again awash with blood and gallows set up all over London by Queen 'Bloody' Mary to take her revenge. 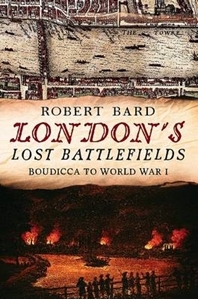 1642 saw two London English Civil Wars battles at Brentford and Turnham Green. Many fleeing Parliamentarian soldiers jumped into the Thames at Brentford and drowned. Some were buried anonymously on Hounslow Heath. Parts of central London still bear the shrapnel marks and memorials relating to Zeppelin attacks that killed 200 Londoners and injured many more. London's Lost Battlefields tells you where you will find them.